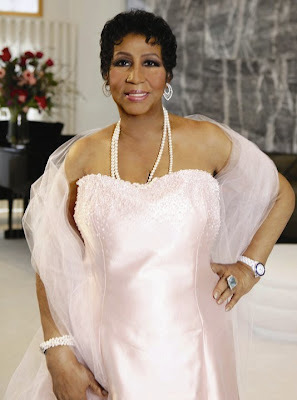 Surgery helped Aretha Franklin lose 85 lbs. – just not that surgery. That's the story the Queen of Soul's sticking to as she once again shoots down rumors about her health, this time the theory that she underwent gastric bypass surgery to drop weight. "Definitely not – and would not," Franklin, 68, tells Access Hollywood in a two-part interview to air Monday and Tuesday. "I heard that [rumor]. I said, 'That is crazy.' "
Since undergoing a mysterious surgical procedure in December for reasons she refuses to reveal, Franklin's health and weight loss have been much-buzzed-about topics. In January, she said she was "not going to even deal with" rumors that she had pancreatic cancer. She did, however, offer a small clue about that surgery, saying that the weight came off "from the surgery that I had," although she did not specify the procedure. "But it definitely was not the bariatric or, what is it, gastric by- – Yeah, I can't even tell you the correct name of it," she says, adding, "It's really not necessary to talk about one's personal medical [health]." Last week, Franklin told Wendy Williams that she ditched fatty foods to drop the weight. Rumors aside, Franklin says it's not just about being lighter, but feeling lighter and having "more energy." "The doctor did say to me, he said, 'Mrs. Franklin, you are going to feel better than you have felt maybe in 10 or 15 years,' " she says. " 'The surgery that you had is going to add 15 years to your life.' "
I'm sorry Savvy Sista but I'm having a hard time believing her story. I know she is a very private person and something you wont to keep private. I believe this is one of those things. I will always love and respect the Queen. So can we say Lap Band or Stomach Stapling? Oh I guess she is doing the same pilates that Star Jones did to lose all her weight. Ladies could I please get a copy of "that DVD" cause I'm trying to lose a few pounds too. Perhaps she had the lap band.